Weeks ago, as Sam and I were leaving my mom’s cabin to head back to our respective cities, we stumbled upon something pretty great. Something unexpected, largely because most little towns in Vermont aren’t necessarily known for wood-fired bakeries serving Intellegentsia coffee, perfectly flaky croissants and traditional cannelés. All of that and one of the lovelier open kitchens I’ve ever laid eyes upon. 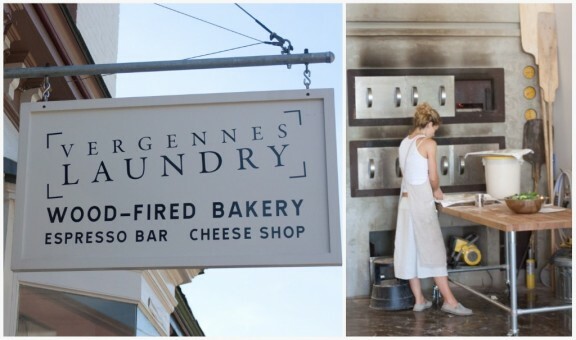 It was mid-day and we were both starving, but before deciding on a good spot for sandwiches, we strolled down the street to peek into an unassuming little bakery: Vergennes Laundry. This isn’t the kind of bakery you can just peek into and keep on walking. 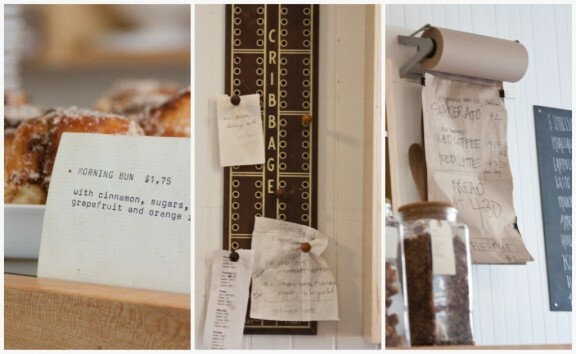 The space is bright and airy with thoughtful details like chunky water jugs, menus on rolls of kraft paper, a cribbage board to post special orders, and a well edited menu with a select few items done very, very well. A pre-lunch snack ensued. We tried a croissant, a gougère made with local cheddar, a crumbly shortbread cookie and a shot of espresso. Sam read the paper and I asked to sneak back into the kitchen to chat with the women about how the bakery came to be in this quiet little town. Julianne Jones is the owner and head baker. She started out at the farmers markets and, with partner Didier Murat, raised money through Kickstarter to build the wood-fired oven, and through their innovative CSE program, raised enough to help build out the actual space. I was impressed by how calm and quiet everything was in the kitchen. It was as if they had all day to produce the savory lunch items they were working on and couldn’t imagine a place they’d rather be. Julianne wore a simple white dress, pretty linen apron and light slip-ons. The mad hustle was replaced with a cool repose, the baggy kitchen clothing was swapped for flowy dresses more familiar with garden tea parties than production facilities, and the fluorescent lighting was traded in for beautiful natural light and pendant fixtures hung from the ceiling. I was ready to move right in. Julianne has built a kitchen that she wants to spend time in — one that can nourish — and immediately upon entering, this is evident. When I asked her if she’s happy now that the bakery’s open and she and Didier are doing what they want to be doing, she looked up at me, paused for what felt like a full thirty seconds and said, “it’s a lot of work.” I recognized this tone: I tell people something similar when they proclaim how amazing it is that I’m following my own dream and how they wish they could do the same. But you could see a certain pride in Julianne’s eyes as she instructed one of her bakers how best to roll out a mound of dough, and commented on how great Didier’s baguette sandwiches looked. They were doing it on their own, together. Back at the table, Sam had ordered another gougère. It was just what we both needed before lunch: light and pillowy with generous pockets of air. 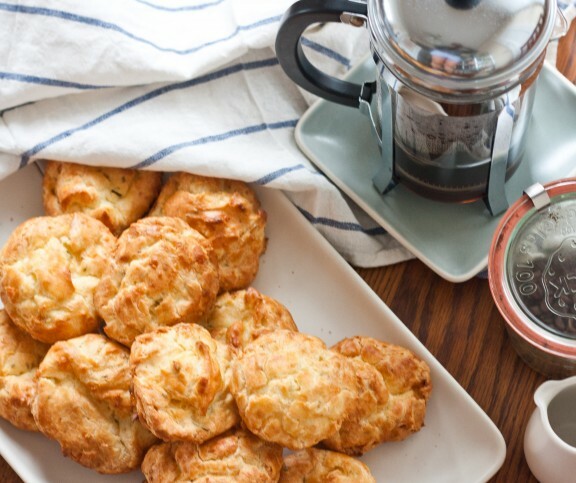 If you’re not familiar with gougères, many people often call them cheese puffs. They’re made from pâte à choux, a great versatile dough that you use to make cream puffs or profiteroles. Here, the only difference is the addition of savory ingredients. So on the first night of August — what is usually a too-hot-to-bake kind of night in the Bay Area — I broke out some butter, flour, and eggs. I chopped some rosemary and retrieved my good Dijon mustard and set out to make a plate of gougères. Last week I read Ashley’s post about giving boxes of cookies away randomly. Just because. Because it’s unexpected and makes people feel good and is just not done often enough. So I planned on saving a few gougères for myself, freezing a few for Sam’s next visit, and bringing the rest to my Heath coworkers in the morning. Just because. To recognizing and enjoying the unexpected — stumbling upon a fantastic bakery in an unassuming town, seeing dancers on your ho-hum street doing their thing, coming home to a box of cookies on your stoop, getting a pie plate in the mail from your mom for no reason, or stumbling into work and finding an airy, cheesy gougère with your name written all over it. We need more stumbling, discovering, making, giving. 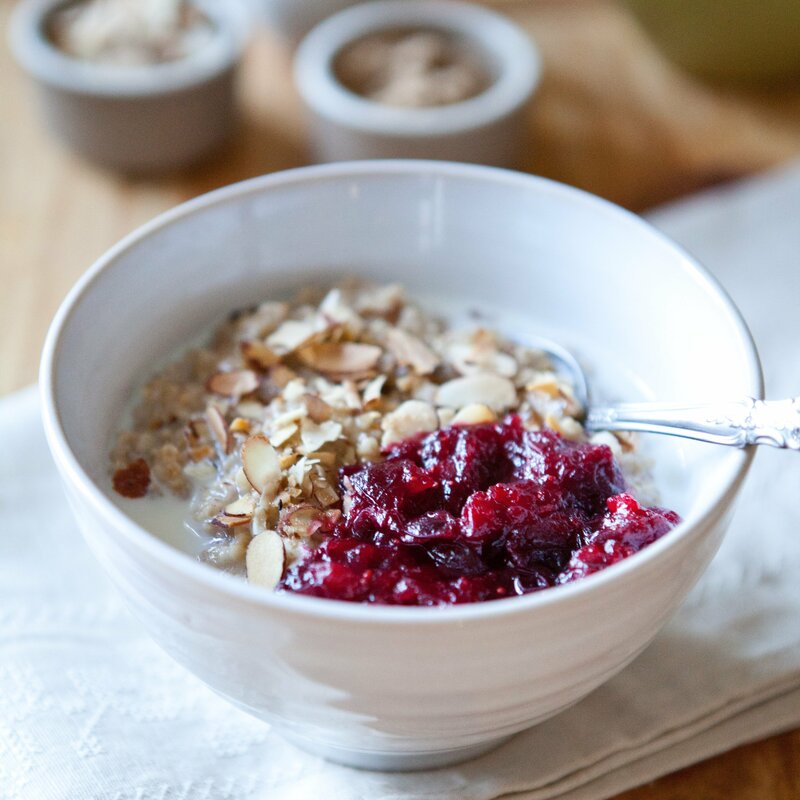 This recipe is based on a classic Dorie Greenspan recipe. Reading about making the pâte à choux may initially seem a little daunting, but it’s really not. This is a pretty forgiving dough and as long as you work quickly and stir like the dickens when you add the flour, you’ll be just fine. Also, listen to Dorie when she instructs you to add one egg at at time; it’s important for the structure of the dough. 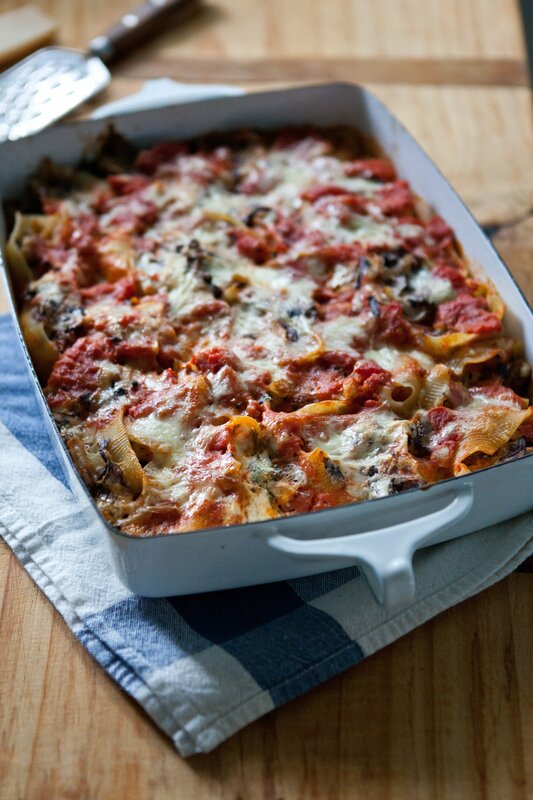 While these are fabulous reheated the next day, they’re so, so good warm right out of the oven. Since I still have some rosemary leftover from Danielle’s garden, I chopped it finely and tossed it in at the end along with a healthy dollop of good Dijon mustard. Feel free to use cheddar if you’d prefer, and add any mix of finely chopped herbs you’d like. These also freeze beautifully if you have leftovers; you can even freeze the mounds of dough before you bake them and bake them off right from the freezer (good party trick). Position two racks into bottom third of the oven and preheat to 425 degrees F. Line two baking sheets with silicone baking mats or parchment paper (or just oil well with olive oil). Bring the milk, water, butter, and salt to a vigorous boil in a heavy-bottomed small to medium saucepan over high heat. Whisk until the butter melts completely. Add the flour all at once, lower the heat to medium-low, and stir quickly with a wooden spoon until the dough comes together in a ball. Keep stirring until dough is no longer sticky and is, instead, smooth, 1-2 minutes. Transfer the dough into the bowl of a mixer fitted with the paddle attachment. Let the dough sit for a minute, then add the eggs one at a time and beat until the dough is nice and shiny. At the very end, stir in the grated cheese, mustard, chopped rosemary, and pepper. Drop rounded tablespoons of dough onto each pan with about 2 inches of space separating each one. Slide the baking sheets into the oven and immediately turn the oven temperature down to 375 degrees F. Bake for 15 minutes, then rotate the pans from front to back and top to bottom. Continue baking until the gougères are golden, firm, and puffed, another 12 to 15 minutes. Serve warm, or transfer the pans to racks to cool. I love unexpected little treasure places. Whether it's bakeries or just coffee shops. They make me smiley. The gougeres look so delicious I almost want to try, even though I'm terrified of doing so, I always feel like I'm not gonna get the right texture and so I haven't tried to make gougeres yet. Your posts are always so inspiring and beautiful. 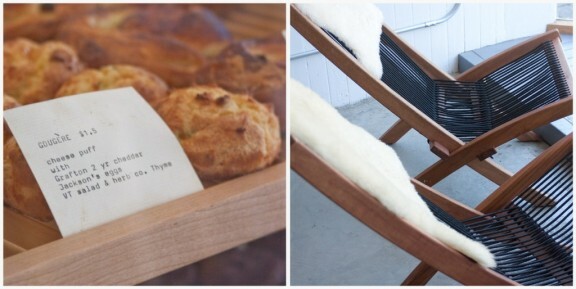 Unexpected find, especially when they involve lovely spaces and delicious baked goods, are so delightful. "We need more stumbling, discovering, making, giving." Such a simple, beautiful thought and so true! I am a new reader to your blog and have been enjoying it very much. Thanks for making a window into your life. You're doing this backyard gardener so proud! I feel like a chuffed parent watching my rosemary go out into the world, spreading its good rosemary love. Cheesy, yes, but perfect sentiments for these adorable puffs of air. Hooray for the unexpected! That bakery looks incredible. I've never made gougeres, but this is inspiring me to give them a go! What a lovely written post, felt like I was there, wish I was. Loved reading this post... I love finding unexpected little spots - especially when the food is good! What a wonderful story!! How exciting, gives one ideas, doesn't it? And those gougeres look lovely. Something I've always wanted to try. 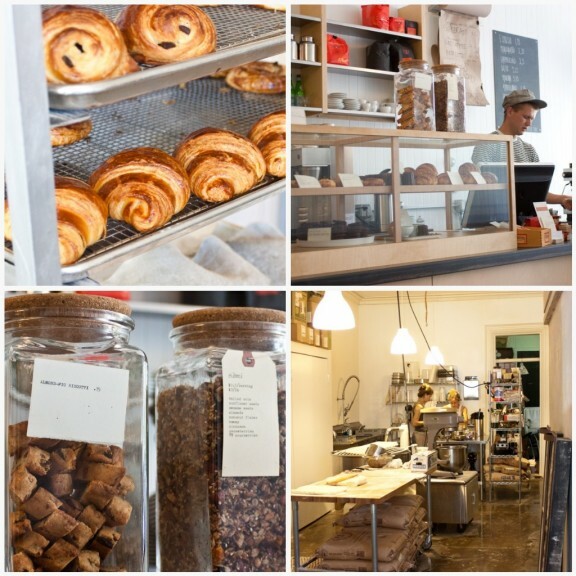 What an adorable bakery--an excellent find! Wonder how the the wood-burning oven impacts the baking? Seems like extra--but probably enjoyable--work keeping the fire stoked. 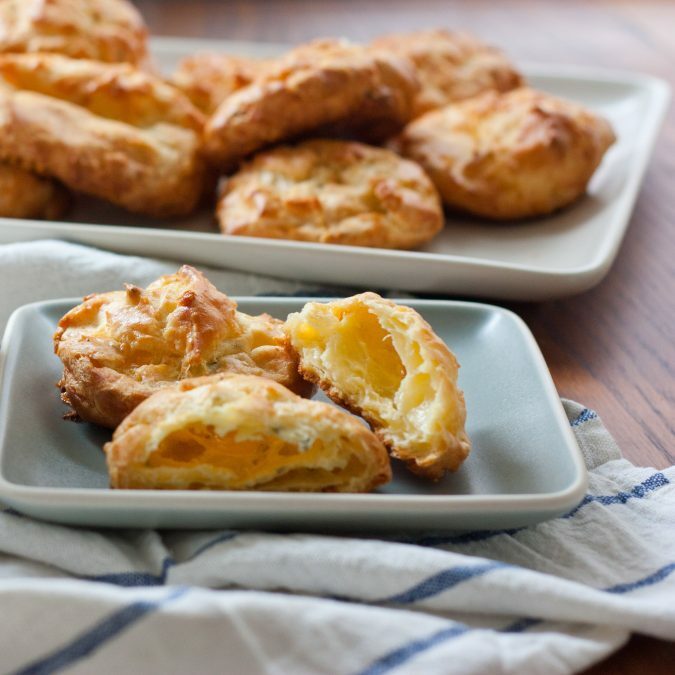 Your gougere look cheesy and puffy and delicious! Thanks for such a nice post on the shop! Julianne! Oh my! I will change the post right now to reflect -- we were actually lost finding you (as you can now tell). We'll be back to visit! My husband and I love Vermont, we traveled to Vermont 5 years ago this coming October for our honeymoon. It was to say the least very romantic, especially at that time of year. 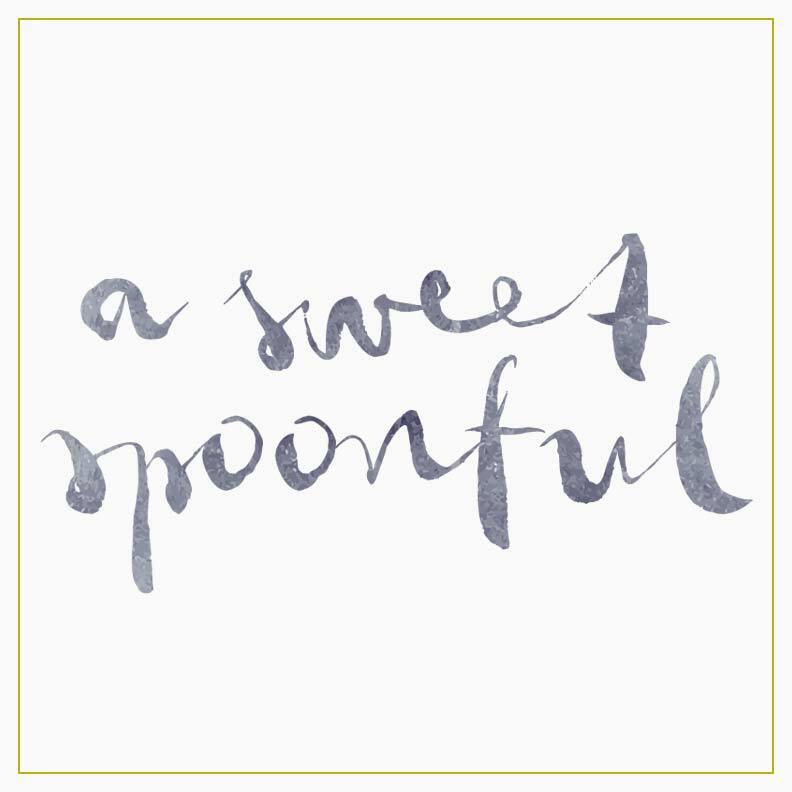 Thank you for sharing all your thoughts, I do enjoy reading your blog, it is lovely! Oh I love making sweet and savory Gourgere, they are my go-to appetizer when I need something a bit elegant. As well they are wonderful with a glass of bubbly! Those unexpected moments are so much fun! It really looks like a pretty cool place. get out. i was expecting this to be some new bakery in l.a, san francisco at least. i am shocked, stunned, bewildered that this place is in vermont. vergennes must have a heavy french population. tres extraordinaire. their chocolate sables look heavenly.